As always during setting up lots of hanging about, odds and ends of equipment forgotten, more hanging about, lots of introductory chat then finally at 10.05 work begins... coffee break at 10.30! Really an excellent crew, plenty of people on board so we just stormed the removal of the turf, such as it was, and topsoil. 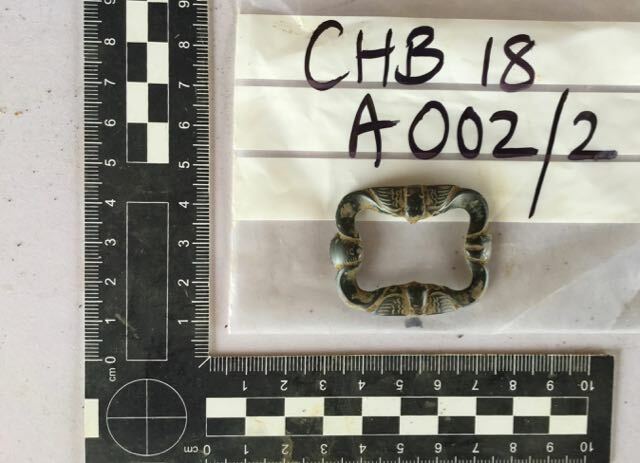 In the meantime Peter had been checking the area over with his metal detector and came up with a rather nice late medieval copper alloy strap end. No other great finds during the removal of the topsoil but I was very taken with the fake plastic fingertip and nail which may have been lost during the course of Halloween revels in 1983! By the end of the day we had two trenches started, the topsoil removed and interesting things starting to appear, ready for ...day two. So here we are at the start of it all, spades to hand, topsoil going and a little later on. trowels in hand cleaning down to the next layer. This enabled us to pick up the darker fill of the ditch which had to go whilst in the B trench, no disrespect intended, Peter got on with the same process. ... and by the end of the day base camp established, two trenches started, we are on our way. Once most of the topsoil was out of the way we got down to the tricky business of defining what was bank, what was ditch and what was just field, Difficult because we are looking at quite subtle shifts in the colour and texture of soil - it's not like finding a wall where you dig until you hit stones then stop. 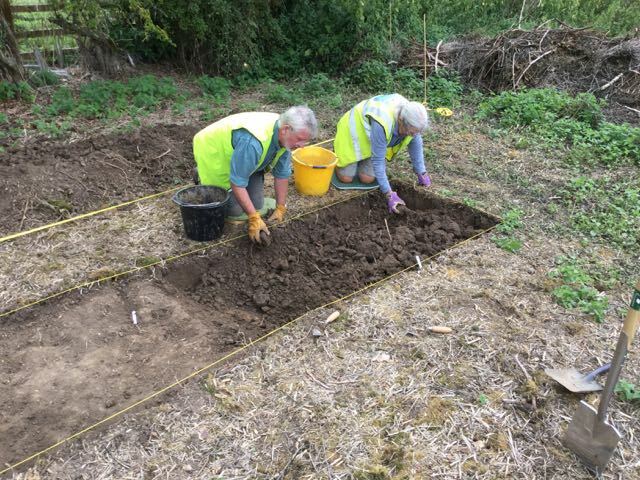 Even so we made good progress and in both trenches potentially identified the uppermost layer of ditch silting which seemed to include significant quantities of the local ironstone rubble or JAFR as it is known in the trade. On further examination even the topsoil we had removed contained a fair selection of pottery from pretty well every century from the 10th. to the 20th.! 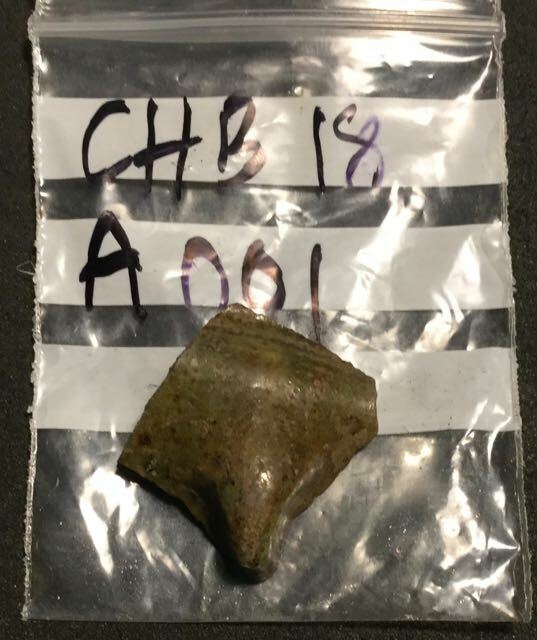 One especially interesting find was a possible fragment of what may initially looked like a fragment of a glass Saxon claw beaker, picture below, as it turned out after a good wash it turned out to be a rather nice piece of glazed pottery, possibly from the well known potteries at Brill. Congratulations to Sarah and Alex who completed the rather tedious task of gathering data for our contour map of the site. 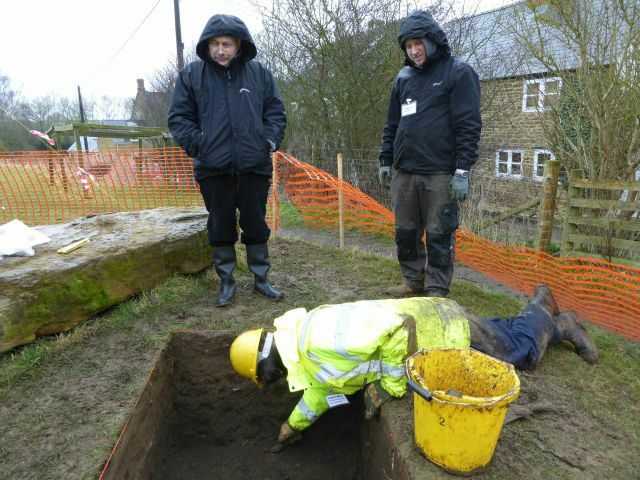 In trench A we try to define the top and bottom of the bank. Eventually we come down onto the rubble filled ditch. Here is our fragment of pottery. from something like this?. Meanwhile in trench B the very soft fill - like digging cream cheese - comes out. An early start for a Sunday and accompanied by church bells! On the long section (Trench A) we tidied up the top of the bank ready for photography whilst at the same time examining an interesting dark, not to say softish, patch behind the bank which may turn into a ditch. Down below the exact limits of the bank and the edges of the lower ditch proved hard to define, however in the course of starting to clear silts we came upon a very fine buckle, probably from a shoe and ornamented - to my eye - with winged cherubs' heads. A massive effort went into taking the levels down at the west end of the trench, special thanks to Ruyton for helping supervise the work. In trench B we again struggled to define the exact edge of the ditch but made some progress before another photo opportunity and then more silt removal. At the other end of the trench we extended it by two metres to the south and then one metre to the east to examine a spread of rubble which may be rubbish... or may not. 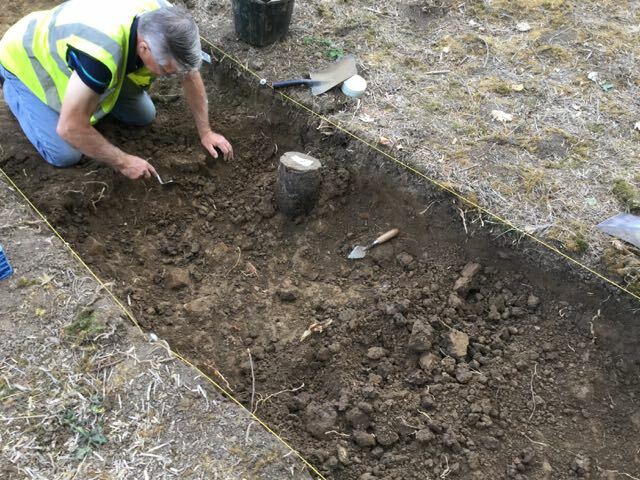 Finally Peter set out the two trenches on the manor house site designed to assess the amount of archaeology surviving and its depth below the surface and most particularly what if any effect the annual bonfire has had on the remains, more to do tomorrow. What a beautiful bank if you like that kind of thing. Everyone searching for the edge of the ditch. Trench B is extended and Trench C is started. Photos from Sarah's phone: the end of the line in Trench A and the rubble filled extension to Trench B. Now this really is rather beautiful, the copper alloy shoe buckle. Several new faces as the new week began plus some of what I'm beginning to regard as stalwarts joined us for a very busy Monday. On the long trench A attention was given ( from east to west) to cleaning the surface of the clayey subsoil (004) digging out more of the fill of the 'behind the rampart' ditch (007), sorting out the interface between the bank (005) and the ditch fill (002), examining the clay subsoil beyond it and plunging down to a slightly lower deposit amply stocked with stones (008) some of which may have formed part of a post pit. Meanwhile on Trench B great efforts in removing ditch silts and coming up with a tiny copper alloy buckle plus useful pottery for dating purposes. 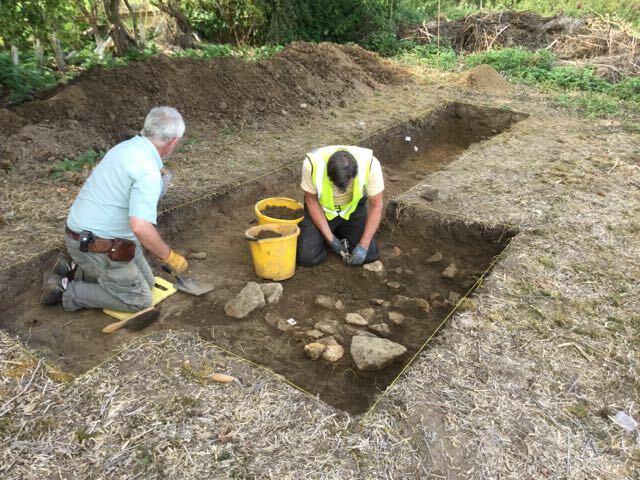 The extension was extended to take a look at the scatter of stones: fill of pit or foundation for hut? Still not sure. Last but not least over on the mound the excavation of a metre square test pit below the heart of the annual conflagration uncovered some fascinating clay plugs identified as former parts of fireworks whilst the trench taking in the perimeter of the fire and the edge of a raised building platform uncovered stones. We were pleased to welcome Liz M. on a visit who dropped in to take a look at the digging, she suggested we 'had everything under control'. Well I'm not sure about that but we have made excellent progress with one more day to go before our two day lay off. A lonely couple on the east end of trench A. An overview with trench B in the background. Peter's crew on the mound with stone and ash. Trench B close to the start of the day, rubble to uncover, and close to the end of the day, ditch to define. 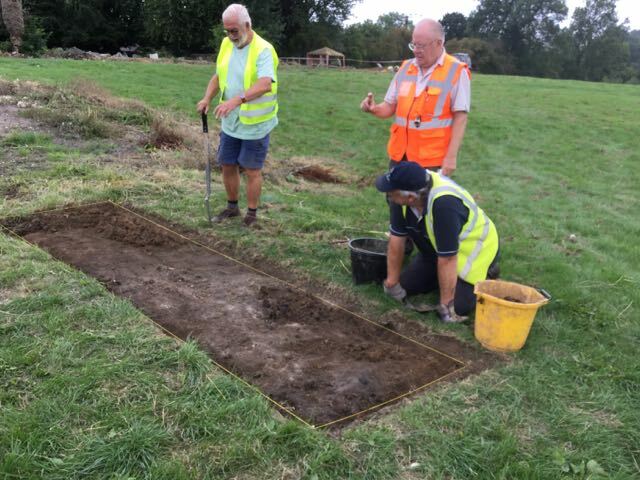 Over on the manor mound the metre square right at the centre of the bonfire site has turned out to be a fascinating exercise in the archaeology of the twentieth century and the science of heat impacting on soil, I'm looking forward to writing it up. The trench cutting into the mound to the east proved to be packed full of building rubble. I'm minded to extend it, probably turning through a right angle and heading off to the north. As I have loads of recording to do back in trenches A and B this will give our volunteers something really interesting to get their teeth into for the next session. A great job cleaning round the rubble revealing it to be... just rubble? Meanwhile the first test pit goes in looking for proper ditch silts. The famous firework pit at the start and the end of the day, a remarkable piece of archaeology and thanks to Brian. The rubble in trench C may turn out to be a little more significant. 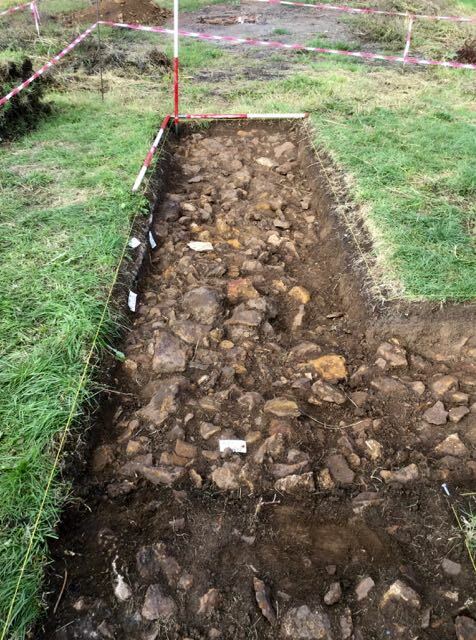 After a two day lay off (well we were on another job at Chastleton) work began in earnest on the mound by extending the main trench in not one but two directions, impressive eh? And at the end of it all massive quantities of rubble waiting to be drawn (thanks Geoff ) and then lifted. Back at the original site massive quantities of dirt shifted in search of undisturbed natural, anyway the possible positions of the ditches has become clearer and it s does indeed look as if we have a series of ditches, well three so far! Meanwhile loads of drawing and recording to do here. All was going so well when around 3.00 p.m. the heaven's opened... rain stops play. Start of day... end of day, just before the rain. 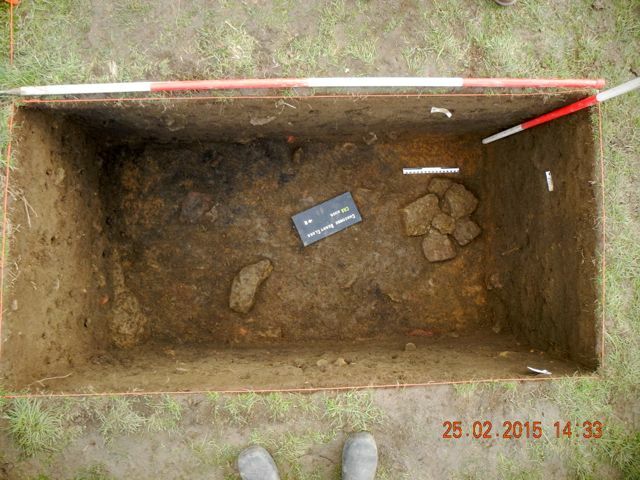 Peter sinks deeper into trench D and here are the marvelous results. 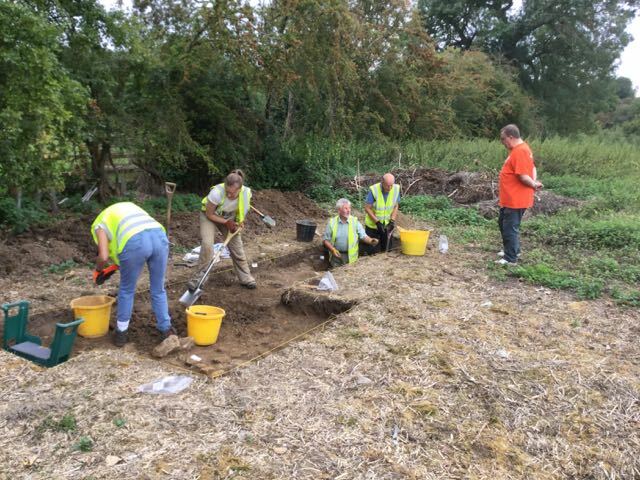 An amazing turn out for a bank holiday weekend, at one point I counted 15 people on site digging away and there may have been more, we had opened two additional 2m extensions to the trench and so had the equivalent of 1 square metre per volunteer, brilliant! For most of us it was cleaning rubble or drawing rubble or shifting rubble but by the end of the day some order was starting emerge from this scene of chaos. In particular we came across a rather poorly constructed dry stone wall which appeared to climb over earlier walls and may be a later post-demolition addition to the site, a simple structure built from the ample rubble lying around. 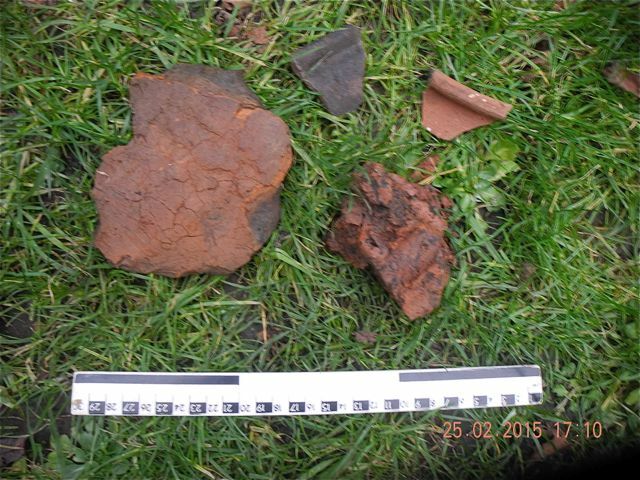 As well as fragments of well dressed stone we also had stone roof tiles and a piece of a possible ceramic roof ornament. A late shower brought proceedings to an end around 3.30 and we cleared the site in anticipation of tomorrow's storms. The crowds getting started on a new day's digging... four, no six new faces! The first sea of rubble photographed and removed! Not forgetting the mother and daughter crew on our ever deepening test pit. Cleaning up the northern extension and a wall starts to appear from amongst the rubble. 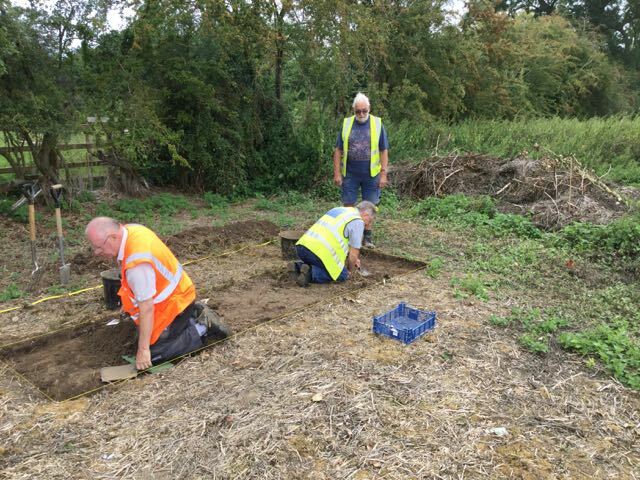 The decision to take a day off on the Sunday in order to let the rain sweep by was the right one so it was on the August Bank Holiday Monday that we reconvened for a further day of digging. The gazebo had remained standing... just but the trenches on the burial ground site were slightly water-logged so we opted to concentrate all our efforts on clearing rubble on the the mound. 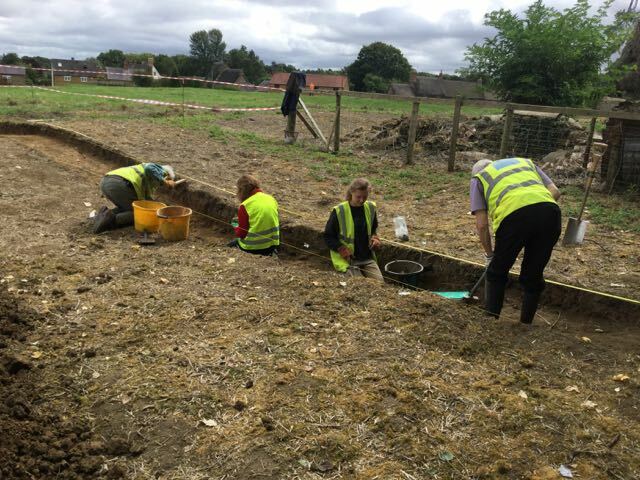 This was hard work but by lunch time it was starting pay off as a definite wall line started to emerge in the northern extension to the trench. Not a great length exposed so my best guess was that we were looking at a section cut across the wall at a point where there may have been a gap or more specifically a doorway. 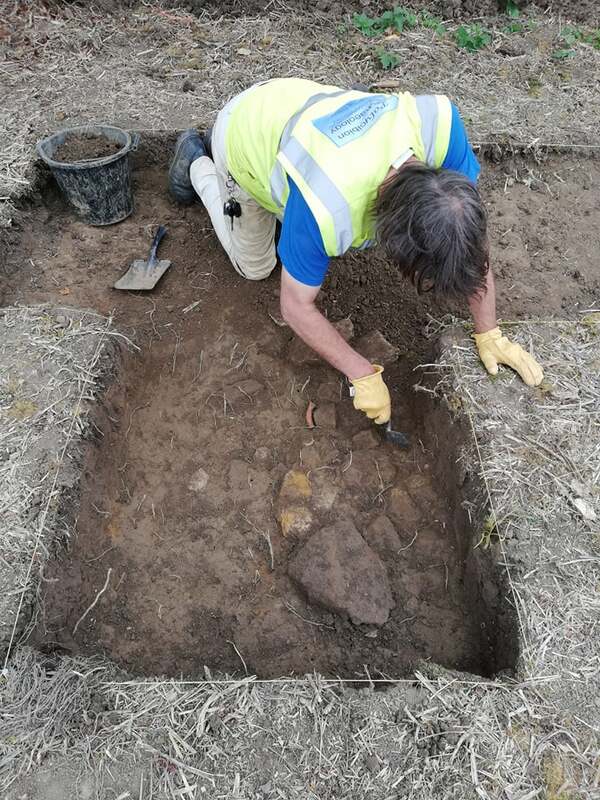 We also took the opportunity to expose more of the first wall uncovered and examine a pile of rubble and mortar along the south side of the trench. All in all plenty of structures placing us very close to achieving all our original objectives. A first look at the line of the lower wall, possibly medieval plus a second look at the upper wall, probably post-medieval. Well the party's almost over, the penultimate day saw us finishing off on the tail ends of assorted trenches, removing rubble and in the case of the eastward extension finding another, albeit rather weedy, wall. We were delighted to welcome Liz back for a final view of and discussion about the site plus thanks to Verna who joined us to take posh close up photos of all the best stonework. After lunch we migrated back to the burial ground site for a final clean up and a last look at the natural underlying clays. Special thanks to two volunteers from Australia - really, who came to help us out. 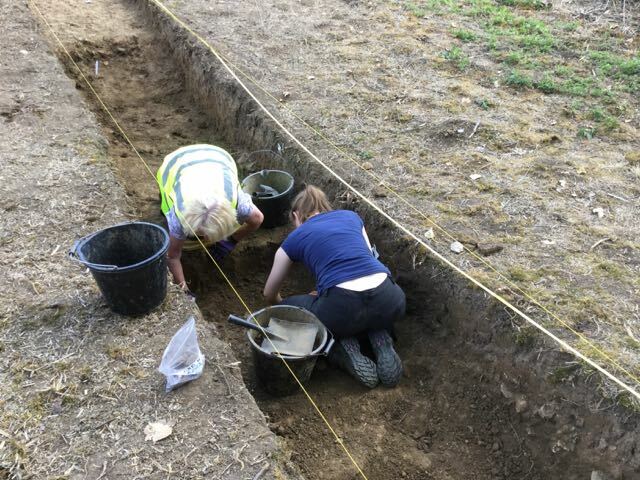 The key moment of the day, apart from taking the gazebo down, was when Sarah, on her last day, found a tiny medieval silver coin, more of this to follow once we have the full analysis. Finishing off the ends, or possibly talking to dogs. Plus our rather weedy wall. The last view of the pit below the bonfire, brilliant stratigraphy and thanks to Peter for finishing it off and drawing it. Sarah's silver sixpence, actually it wasn't a sixpence, probably a farthing but I couldn't resist the alliteration. 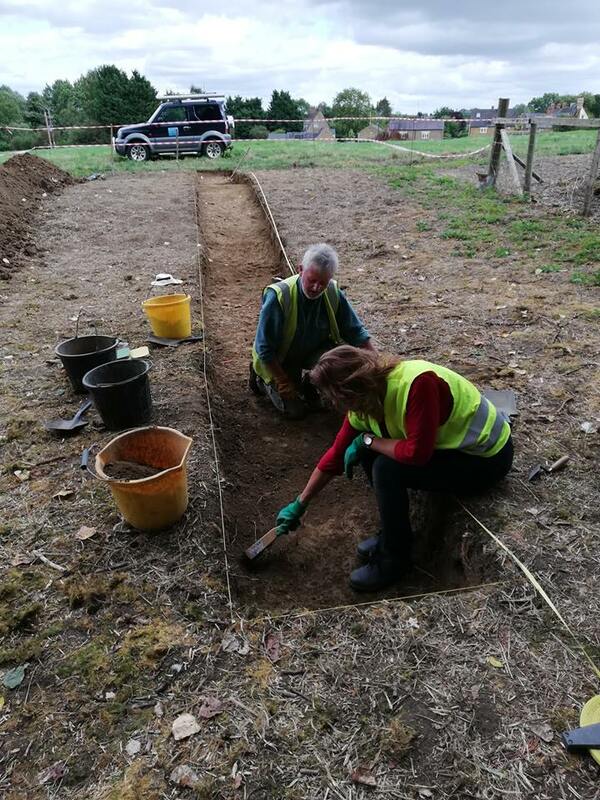 A final look at the long trench with its bank and three ditches, the last scrape of the dig is underway here. 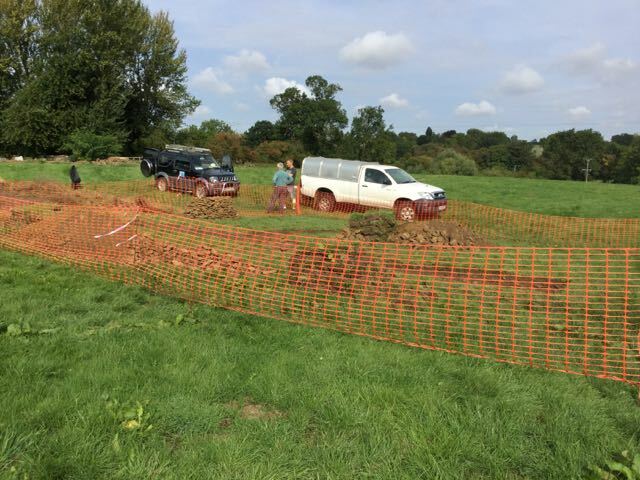 So that's it, a morning spent filling in the test pit below the centre of the bonfire and fencing off the trenches on the manor site and we are done. 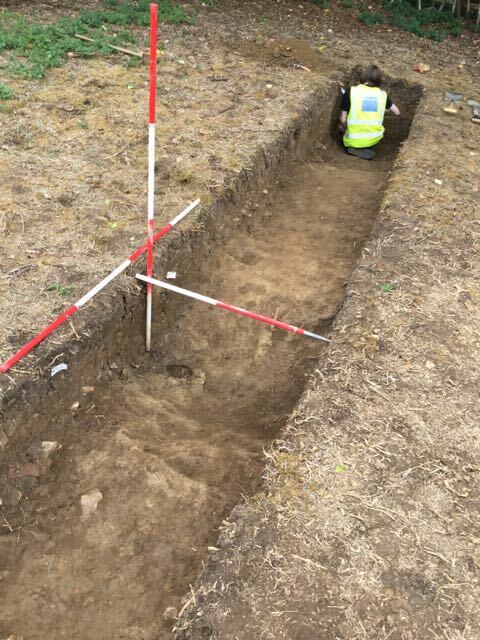 Hopefully the burial ground site will have been filled by the weekend and the manor house site will remain open for a couple of weeks for viewing before back-filling. My extra half day will be spent re turfing the area then it's on to finds washing. Geoff shovels back the last few spadefuls of loose dirt and a new roll of barrier fencing is installed around the excavation. Fig. 1 St. Peter’s Church Chacombe view from east. 1.1.1 This document comprises the written scheme of investigation (WSI) for archaeological evaluation of a plot of land planned to be an extension to the graveyard attached to St. Peter’s Church (Fig. 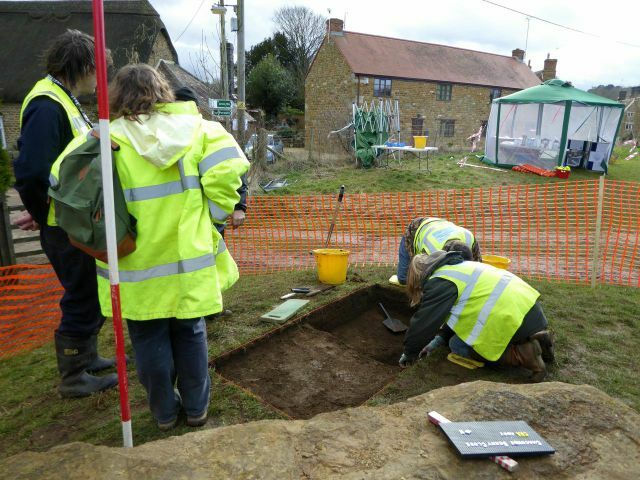 1) and is drawn up in accordance with advice provided by Liz Mordue, Assistant Archaeological adviser for Northamptonshire C.C. 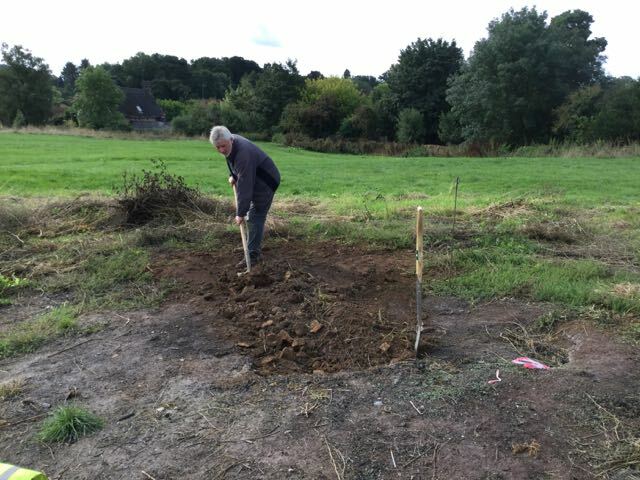 1.1.2 Polyolbion Archaeology has been commissioned by the trustees of the Berry Close Charitable Trust to prepare this scheme in order to facilitate future development of the site as a burial ground. 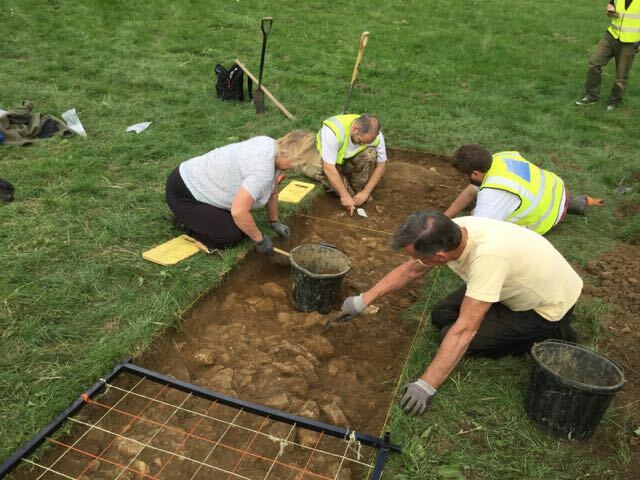 In addition it was agreed that the opportunity would be taken to study the effects of the annual village bonfire on the archaeological deposits associated with the likely site of the manor house. 1.1.3 The study area consists of a plot of approximately 400 square metres aligned roughly north south along the north and east side of the churchyard and centred on OS grid reference SP4907 4401, the bonfire site lies around 50m south east of the main study area (Fig. 2). 1.2.1 Topography. Berry Close is a significant parcel of land bequeathed to the residents of the Parish of Chacombe situated between some of the oldest buildings of Chacombe, with the 13th Century Church of St Peter and St Paul at its western edge and at least one late medieval building in Silver Street to the east . Prior to bequest it was a tenanted smallholding of sheep grazed pasture containing some small sheds, now demolished. The field contains a complex of earthworks, some well marked with others in a fragmentary state. The landscape is open and the topography consists of Chacombe brook flood plain at the northern end at 115 m OD, rising up to 120 m above OD at the southern end. On the south side it is bounded by Church Lane and on the south end of the east side by Silver Street. Berry Close is above both roads to a height of nearly 2 m in places and the ground retained by a dry stone wall of unknown date. Beneath the soil there is likely to be alluvial clay, especially in the valley bottom. The underlying rock belongs to the Lias group and is predominantly an iron-rich limestone containing some shelly bands, though there may also be some mudstone and siltstone . In the Domesday Book, Godfrey is recorded as holding the Manor of Chacombe in the fee of the Bishop of Lincoln. The Lord of the Manor in 1109, in the reign of Henry I, was Sir Hugh de Anas who came over with William the Conqueror in 1066. His son, Sir Roger de Chacombe, adopted the local name in lieu of Anas. Sir Roger de Chacombe’s son, Hugh, was justiciary of Normandy in the second year of the reign of King John, in 1200. He had a wife Hodierna, a daughter Amabilia, and he lived at the Manor. In 1209, Hugh de Chacombe entered the Augustinian Priory as a religious, indicating that the Priory was built in the early thirteenth century and it appears that Chacombe Church was rebuilt soon afterwards. The Priory grounds are about 500 metres west of Berry Close. In 1257 the whole manor was seized for debt by Henry III but eventually possession was restored to the Lord of the Manor at that time, Sir Robert de Chacombe. Robert had no son but one daughter, another Amabilia. She married Gilbert de Segrave, and so, on the death of Robert, the Manor became the property of the de Segraves. 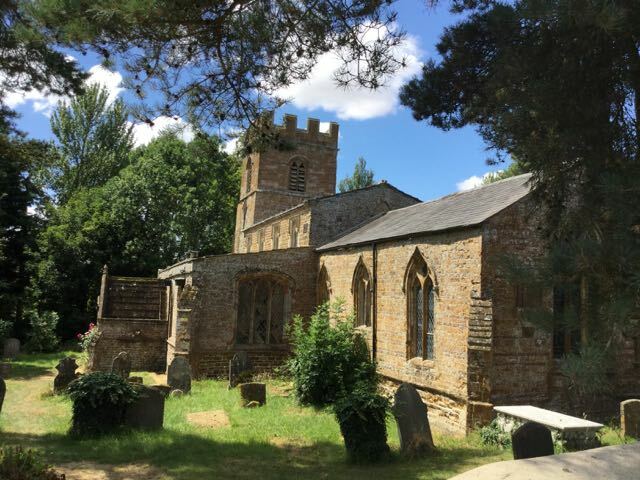 In the sixth year of office of the Bishop Grotête in 1241, William de Collingham was elected Prior of Chacombe by licence of Gilbert de Segrave, the patron Adam de Appelby succeeded in 1279 and Robert Warden in 1299. Alexander de Kaysthorpe was Prior in 1302 and, on his death in 1326, the Canons having made an irregular election, the Bishop, with licence from the King, appointed Roger de Silby, on 19th. April. Thomas de Saxton, the next Prior, resigned in 1339 and was succeeded by Henry de Keysworth. On St. Michael’s Day, 1346, the Prior and Convent received Benefits conferred upon them by John de Lyons, Lord of Warkworth, who granted to them and their successors a sum “to find two secular priests who in the Chapel of Warkworth shall perform services for the healthful state of the said nobleman so long as he lives”. On the 20th. March 1371, Edmund de Thorp became Prior of Chacombe and he had been followed by Thomas de Brackley by 1412. John Gerneall was Prior of Chacombe in 1495 and Thomas Saunders was the last Prior . 1.2.3 Archaeology. 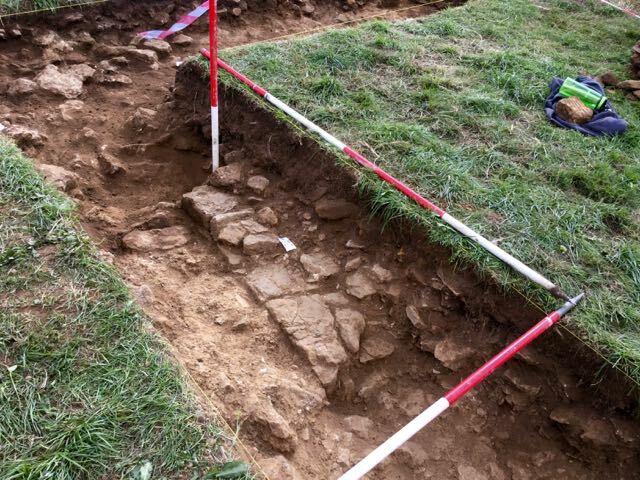 The site of the medieval manor has not been firmly established but is stated by the RCHM as being on the mound forming the most prominent earthwork in Berry Close and at the highest point in it, dominating the older part of Chacombe village . Despite being damaged, it still has a substantial scarp, up to 2 m high, inside a ditch on the west. 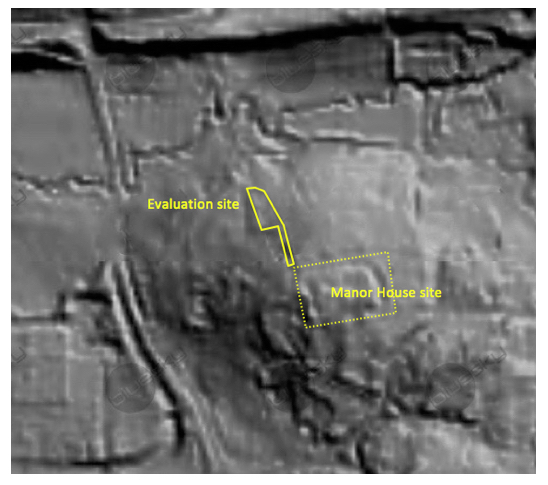 The proximity of this mound to the Church suggests that it is the site of a high status building and a detailed earthwork survey carried out in 2016 supported this interpretation (Fig. 3). 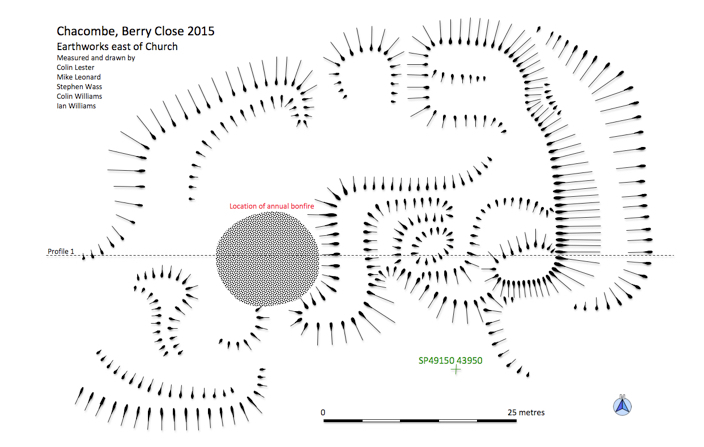 A magnetometry survey of the non-floodplain sections of Berry Close showed that medieval or early post-medieval settlement remains extend across much of the area surveyed . 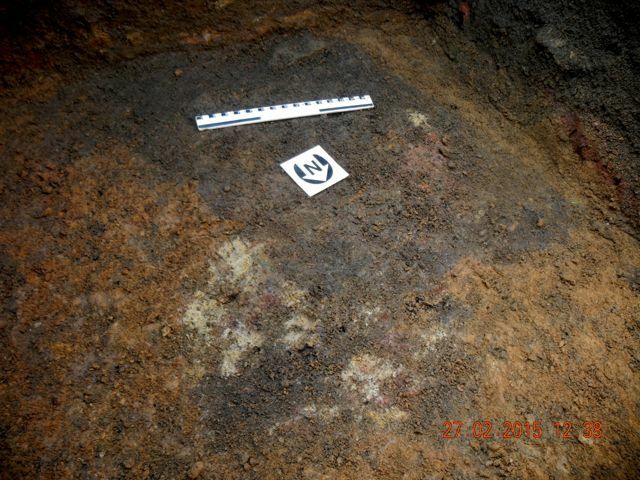 The dense and overlapping nature of the remains indicates that occupation was prolonged and the site went through more than one phase of development. Lidar Coverage (Fig. 4) and air photography of Berry Close shows outlines of banks and terraces, along with later small-scale quarry pits (Northamptonshire SMR 27/3, 27/3/1, MNN14763, 123191). A hollow-way and possible settlement tofts and crofts from the once more extensive medieval village are situated to the north and north-east (SMR 27/0/1, 27/0/26, MNN17831, 1231). 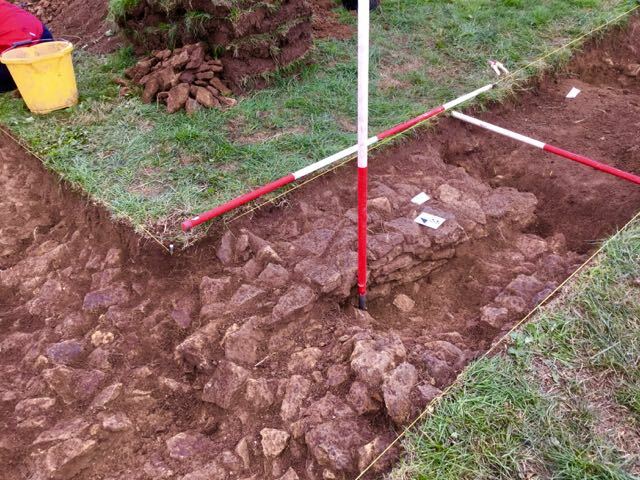 A small scale excavation near the south east corner of the field in 2015 uncovered significant traces of early medieval occupation and pottery , however two trenches to the east of the churchyard by Northamptonshire Archaeology in 2012 found no significant archaeological deposits with natural lying at a depth of less than half a metre . The nearby Priory site is associated with a number of fish ponds, and air photographs show at least one fish pond along Chacombe Brook only just past the section of this brook that forms the northern boundary of Berry Close. The earthworks in the valley bottom of Berry Close might be associated with the medieval water management organised by the Priory. 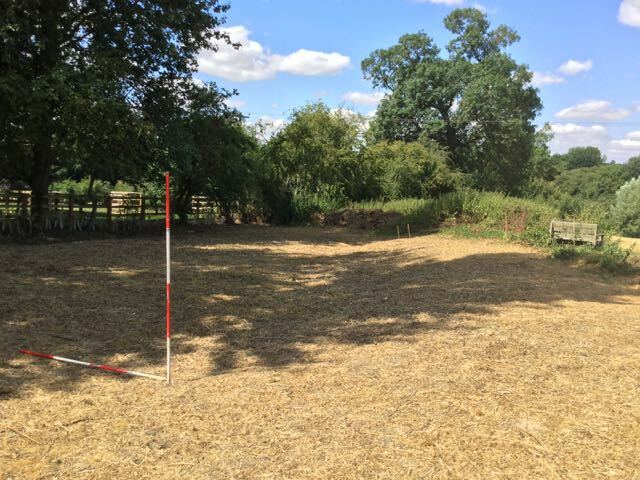 About a mile away from the site but within the Parish a rectangular enclosure and other marks suggest a prehistoric or Roman site, but on a separate site there may be a substantial Roman building associated with Castle Farm, which is a little nearer. 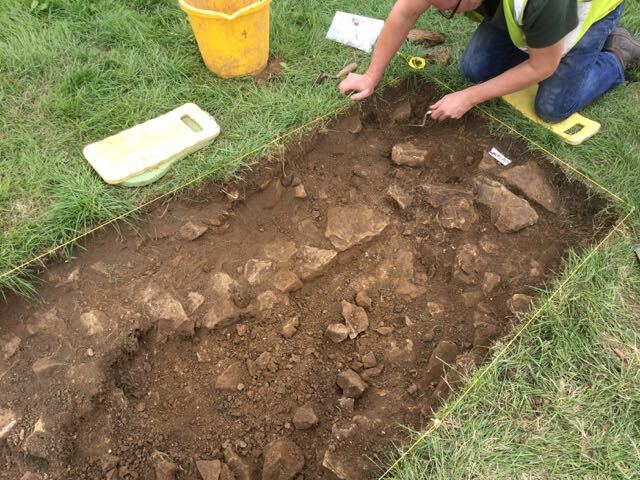 A Bronze Age scraper and some flints were discovered by a village resident on Chacombe Lodge Farm which is more than a mile from the site . Specific objectives of the investigation are listed below. 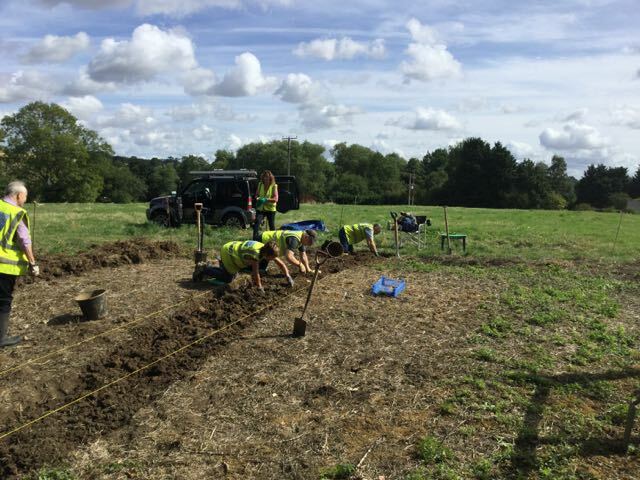 2.1 Identify any previously unrecorded archaeological features and deposits of interest including palaeo-environmental remains if present. 2.2 Record identified archaeological features and deposits to a level to enable their extent, nature and significance to be identified and so establish a stratigraphic sequence if appropriate. 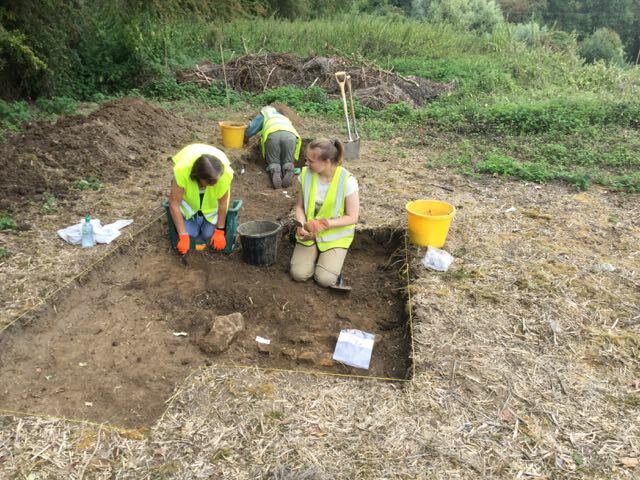 2.4 Undertake sufficient post-excavation analysis to confidently interpret archaeological features identified during field work including dating where possible. 2.5 Undertake sufficient post-excavation analysis of artefacts and samples to support interpretations made of features identified and to assist in regional analysis of type series. Investigate the development, structure and landholdings of manorial estate centres . 3.1 Personnel. The lead archaeologist will be Stephen Wass MA MCIfA who has considerable expertise in the field of historic gardens. 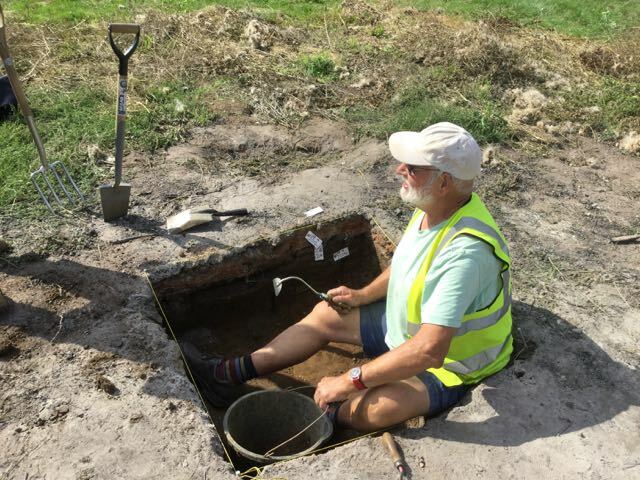 He will be supported by Peter Spackman BA ACIfA who will assist with finds and Sarah Beaujean, intern and second year archaeology undergraduate, Durham University. We do not anticipate the need for additional specialist advice except perhaps for analysis of medieval pottery. 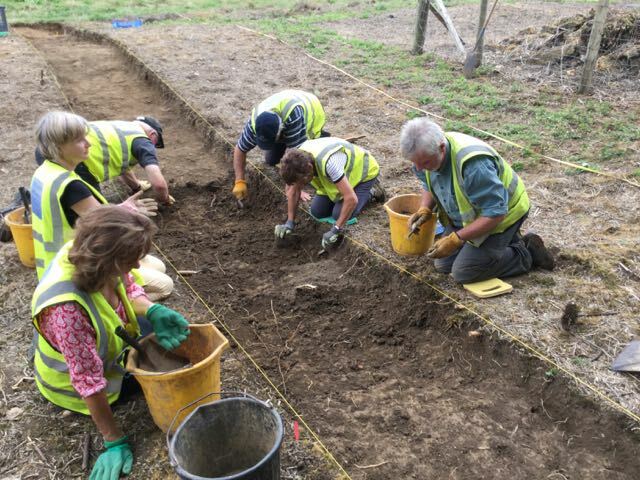 Much of the actual excavation will be carried out by a team of local volunteers some of who already have considerable archaeological experience. A timetable will be provided and forwarded to the Assistant Archaeological adviser. 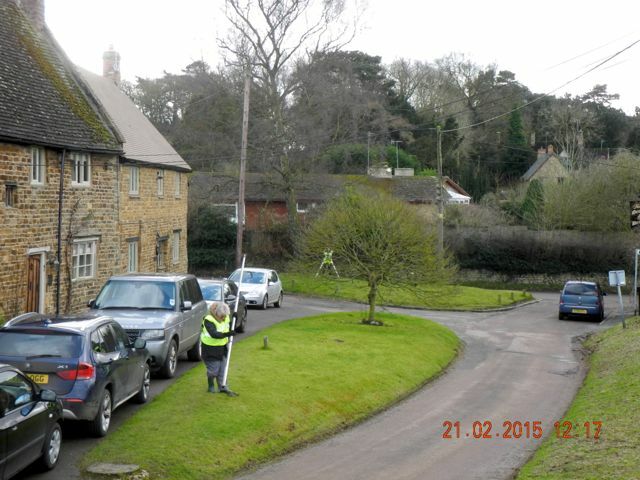 3.2 Site Clearance and earthwork survey. The site has already been cleared of undergrowth enabling a detailed earthwork survey which will be undertaken before excavation starts and which will be factored in when it comes to the precise placing of trenches, however, it is clear that a major boundary earthwork consisting of a rampart with outer ditch occupies over half of the area for evaluation (Fig. 5). 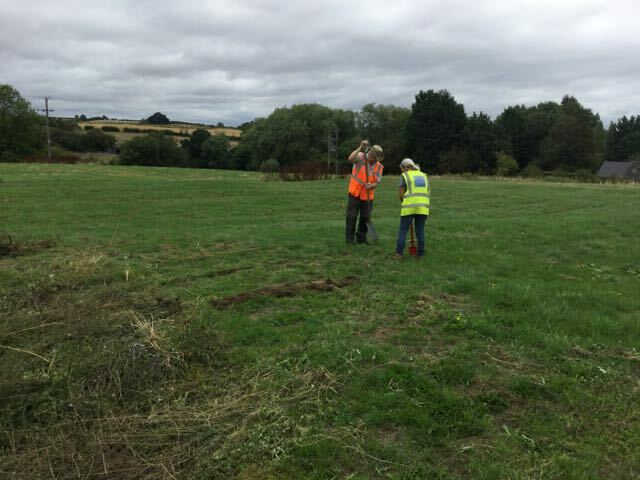 A metal detector survey will also be undertaken across the area. Fig. 5 Bank and ditch, view looking north across evaluation area. 3.3 Location of trenches. Given the presence of a major bank and ditch defining the eastern half of the site trench 1 (6m x 1m) will cut across this from east to west and will be of sufficient length to characterize possible occupation on either side of the earthwork. 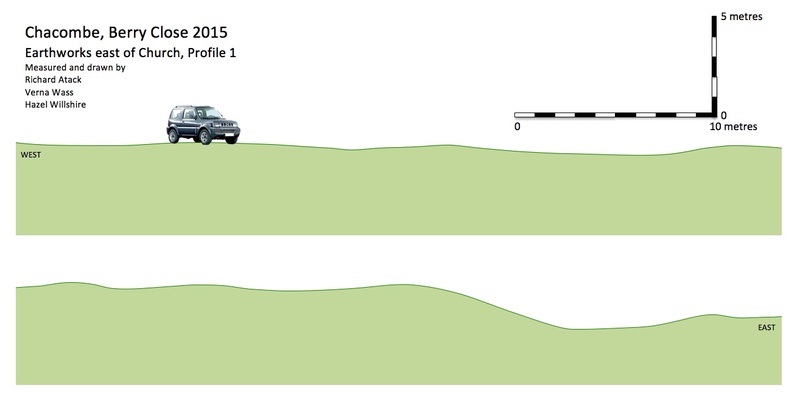 Trench 2 (4m x 1m) will be located towards the north west corner of the evaluation area to further examine deposits within the curve of the ditch as it bends to the west. 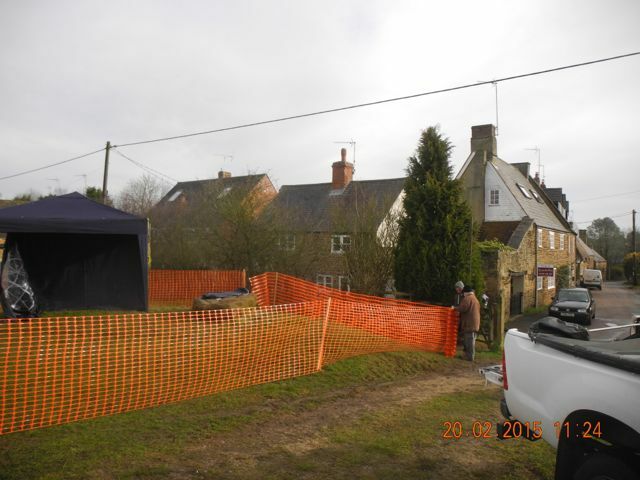 In addition two small trenches (2m x 1m) will be positioned on the site of the annual bonfire on Berry Mound. 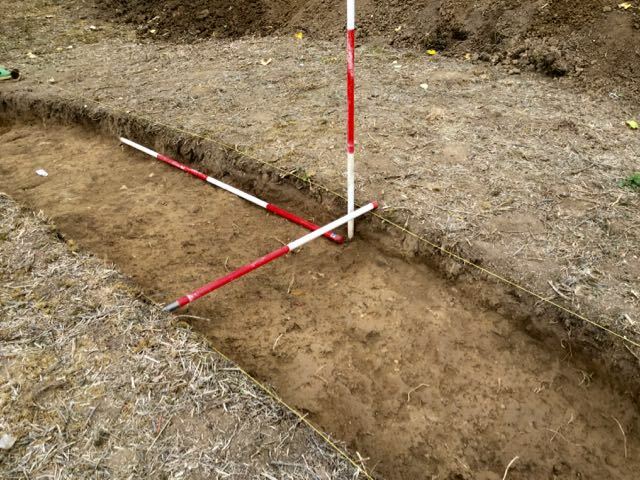 Trench 3 will take in the perimeter of the fire zone and will examine a portion of undisturbed ground as well as the progressive effects of burning whilst trench 4 will be at the centre of the area to investigate the effects of the fire at its most intense (Fig. 2). 3.4 Excavation. Excavation will be carried out by hand. 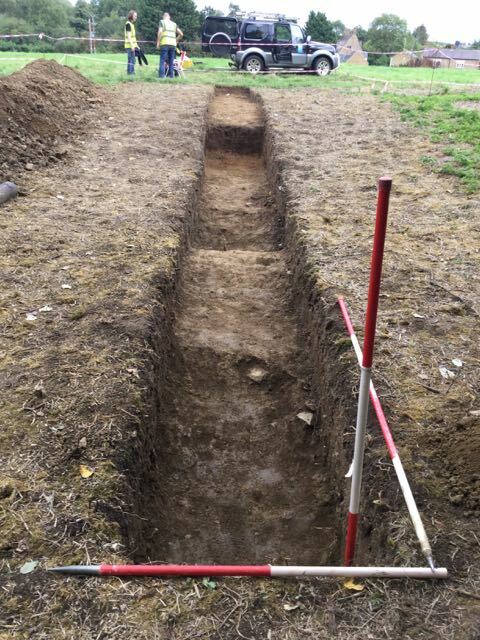 With trenches 1 and 2 this will expose all archaeological levels down to natural unless, as possibly with the ditch, this proves to be over a metre in depth in which case, to facilitate full excavation, the trench will be widened and stepped to ensure safe working. If this is necessary a machine with a toothless grading bucket may be brought in to clear some of the overburden. Trenches 3 and 4 will only be excavated down to the top of the first archaeologically significant horizon with some additional cleaning to help fully characterize any deposits encountered. 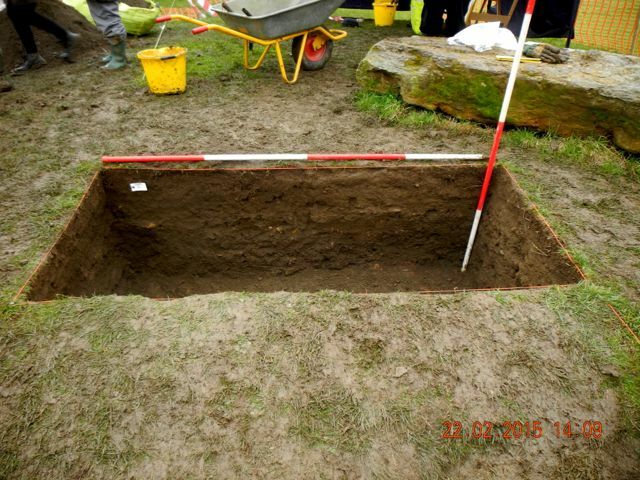 All archaeological excavations will be carried out in accordance with Institute for Archaeologists guidelines . 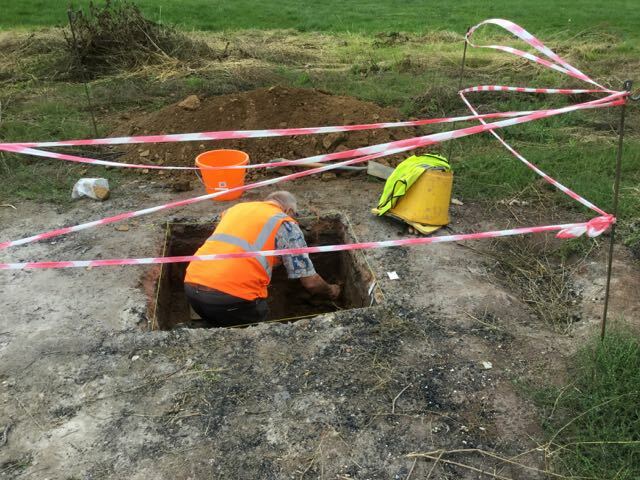 In addition the excavation will be carried out in accordance with relevant English Heritage guidance for specialist sampling, assessment and analysis as appropriate . 3.5 All artefacts will be retained for processing and analysis by appropriately qualified and competent staff. 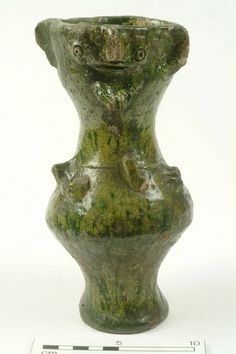 Should significant medieval pottery be recovered Dr. Paul Blinkhorn will be approached for expert analysis. ceramics will be classified in accordance with the Northamptonshire Ceramic Type Series. Where it is considered potentially beneficial appropriate environmental samples will be collected and screened for analysis. 3.8 If deemed appropriate for occupation layers such as floors of buildings; ditch, pit and posthole fills; and the fills of other cut features, bulk samples for coarse sieving and flotation will be taken. 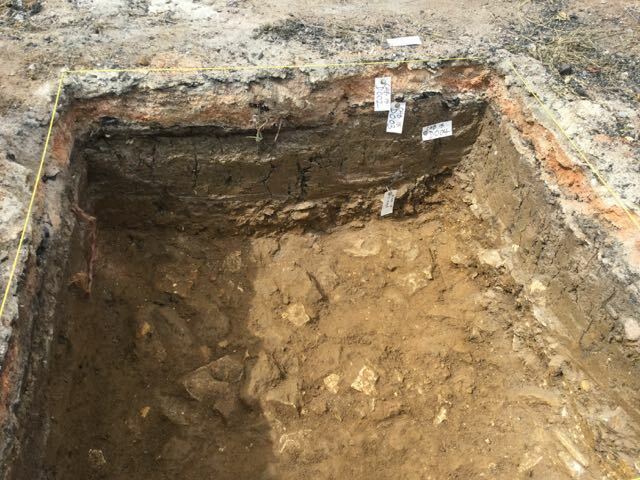 Sample sizes will be a minimum of 40 litres or 100% of the sample of the feature excavated. Bulk samples may be sub-sampled at a later stage for particular analyses (e.g. molluscs). If appropriate samples suitable for scientific dating will be taken if encountered during the excavation. 3.9 In the unlikely event human remains the appropriate Department for Constitutional Affairs and environmental health regulations will be followed. The Assistant Archaeological Advisor and the local Coroner must be informed immediately upon their discovery. Where human remains are encountered as part of the investigation, they will be left in situ and only removed if absolutely necessary. 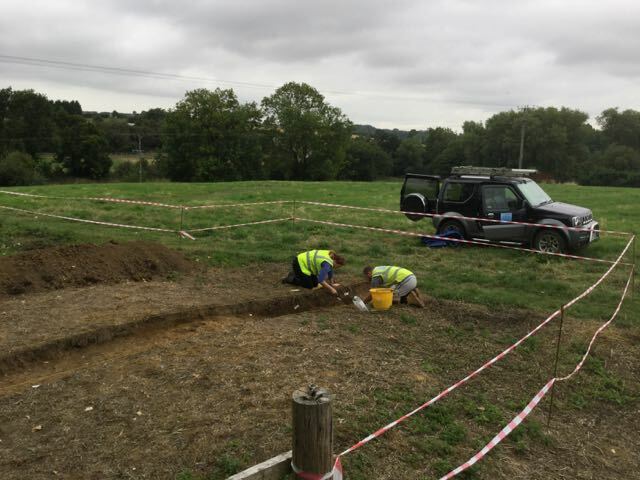 If they are removed the post-excavation assessment will contain an analysis of the remains by a qualified osteo-archaeologist and a statement for the final deposition of the assemblage and the options for reburial. 3.11 Artefacts classified as Treasure under the Treasure Act (1996) will reported in accordance with the requirements of the Act. Any finds will be removed to a safe place and be reported to the local coroner as required by the procedures as laid down in the Treasure Act Code of Practice 2002. Where removal cannot be effected on the same working day as the discovery, suitable security measures will be taken to protect the find(s) from theft. 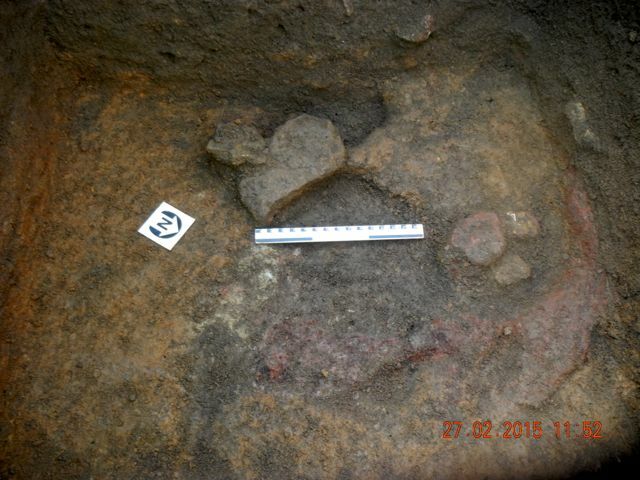 4.1 Archaeological remains of a medieval and possibly post-medieval date are possible. 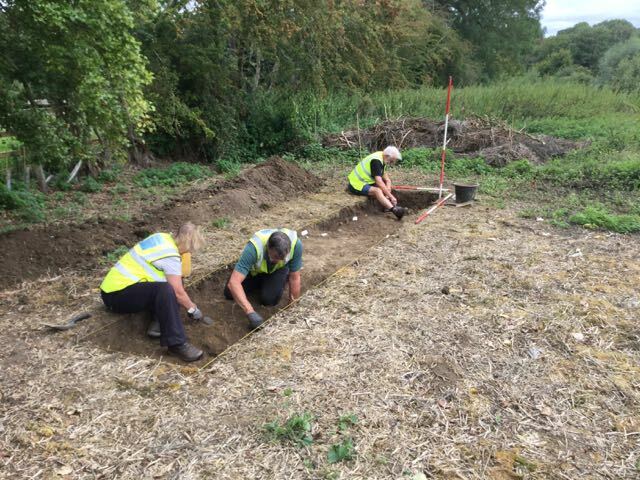 Should unexpectedly extensive remains of previously unrecorded archaeology be uncovered the scope of this programme will be reviewed to determine the most appropriate recording and sampling strategy for the remains. 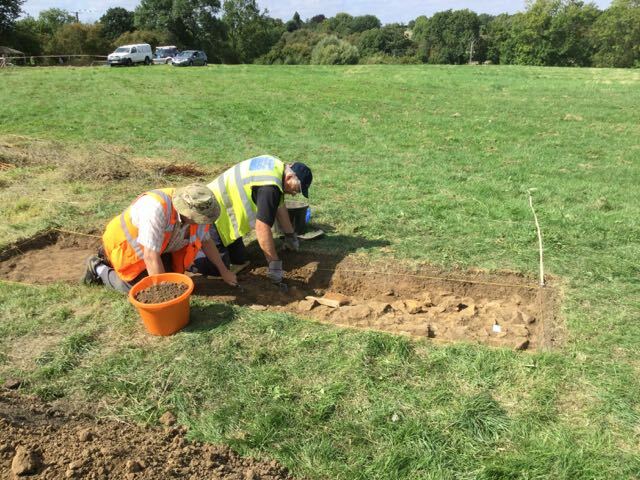 Should there be unexpectedly significant or complex discoveries made that warrant a more detailed investigation than is appropriate within the terms of this proposal, then the scope of this work will be reviewed in conjunction with the client and the Assistant Archaeological Advisor. 5.1 All excavated deposits will be fully recorded by detailed written context records on digital pro-forma sheets giving details of their location, composition, dimensions, shape, any relationships, finds and samples with standardised descriptions following Soil Survey soil texture terminology and Munsell colour descriptions. The records will be cross referenced to other elements of the record and any other relevant contexts. 5.2 All features will be recorded on at least one plan, normally at 1:10 scale and at least one section drawing of a feature, normally at 1:10 scale (1:20 if necessary due to size). A complete post excavation plan of the trenches will be prepared at an appropriate scale. All drawings will include co-ordinate data as is necessary for the accurate location of the area planned or the section drawn and spot-heights related to the Ordnance Survey Datum. 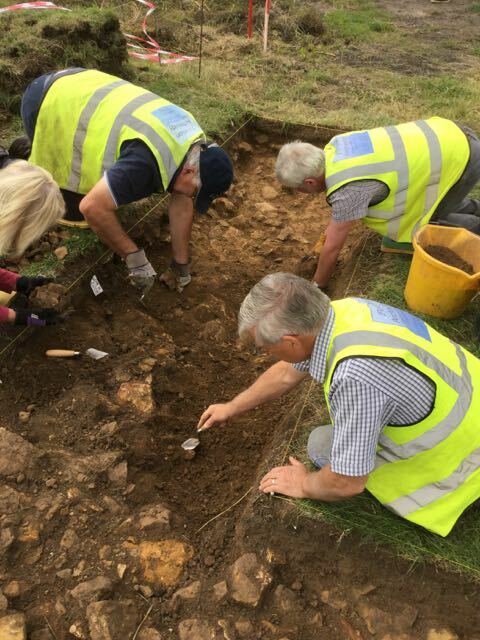 5.3 All excavated features and deposits will be photographed in accordance with the Northamptonshire Archaeological Archives Standard (2014) specifically digital photographs on a high-resolution digital SLR camera with sensors exceeding 12 Mega pixels (TIFF format). All such photographs will include a scale, a north arrow and an information board displaying the HER event UID number and the principal context number. 5.4 All finds recovered will be recorded by context. 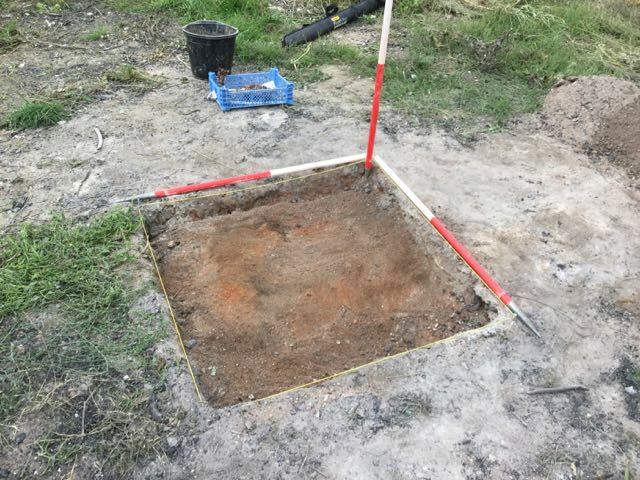 A metal detector may be used to test for the presence of and to aid the recovery of small metalwork finds surviving on site. All retained artefacts shall be removed from site for specialist examination and analysis and, if deemed necessary, conservation. Cleaning of objects may take place on site, or upon removal as is deemed appropriate. All recording, cleaning, storage and conservation of finds will be in accordance with the relevant guidance . 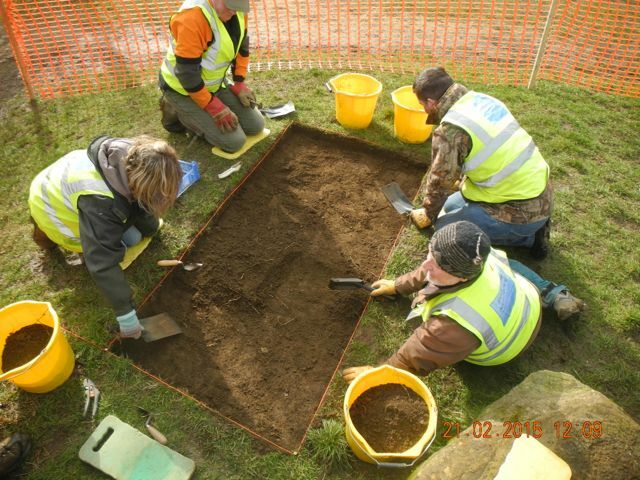 6.1 Health and safety will take priority over archaeological matters. All archaeologists undertaking fieldwork will comply with all current Health and Safety Legislation. A Construction Design Management Designers Risk Assessment will be completed prior to work beginning. 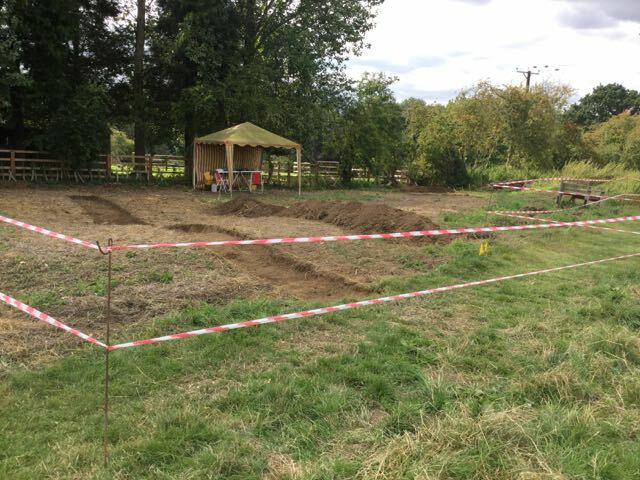 Should it prove necessary any open trenches will be fenced off using suitably visible fencing and appropriate measures taken to warn visitors of any risk. 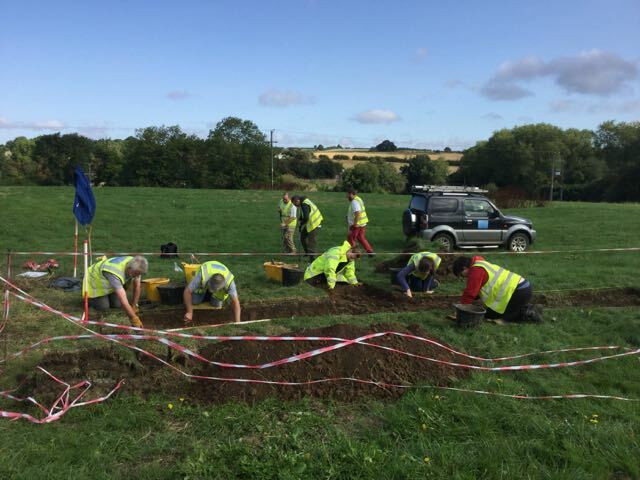 6.2 Archaeologists will not normally enter any trenches deeper than 1 metre unless the trench has been stepped or battered along the sides or provided appropriate shoring and support to a recognised standard . 6.3 All personnel will be given appropriate health and safety briefings and will be instructed to wear hard hats where needed, safety boots and high-visibility clothing on site. 6.4 The archaeological contractor will carry appropriate insurance cover. 7.1 The site archive will contain all the data collected during the excavations, including records, finds and environmental samples. 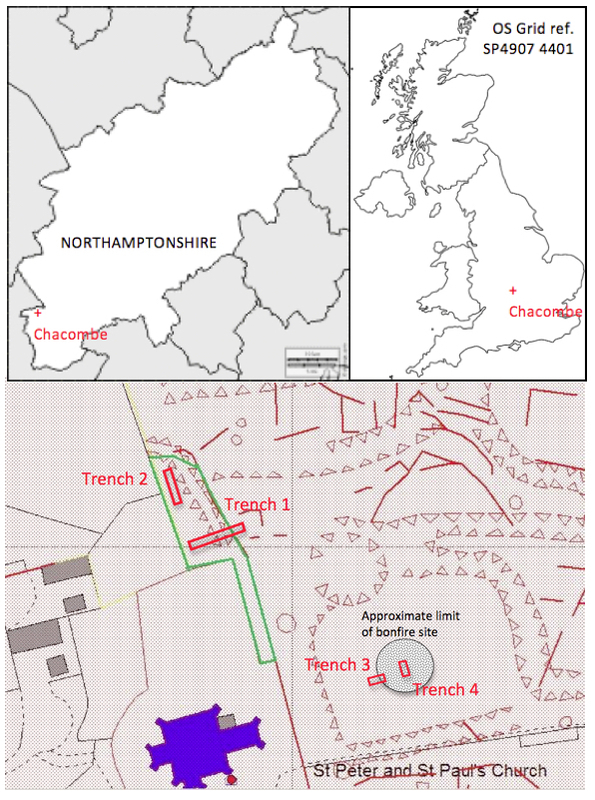 It will be quantified, ordered, indexed and internally consistent according to the Northamptonshire Archaeological Archives Standard (2014) . Adequate resources will be provided during fieldwork to ensure that all records are checked and internally consistent. Archive consolidation will be undertaken immediately following the conclusion of fieldwork. The site record will be checked, cross–referenced and indexed as necessary and all retained artefacts will be cleaned, conserved, marked and packaged in accordance with relevant guidance. 7.2 All retained artefacts will be assessed and recorded using pro forma recording sheets, by suitably qualified and experienced staff. Initial artefact dating will be integrated with any site matrix. The potential for further analysis of artefacts will be assessed. 7.3 All retained environmental samples will be processed by suitably experienced and qualified staff and recorded using pro forma recording sheets, to identify at the presence or absence of environmental remains and the potential for further analysis. 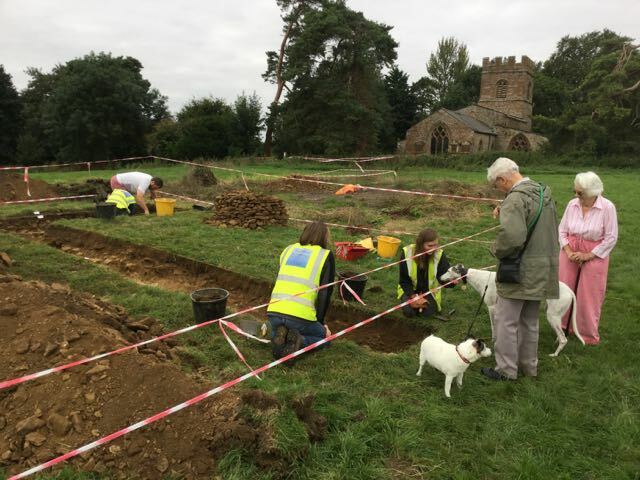 7.4 The archive both physical and digital will be assembled in accordance with the specification set out in Northamptonshire Archaeological Archives Standard (2014). The integrity of the primary field record will be preserved. Digital security copies will be maintained where appropriate. 8.1 The lead archaeologist will provide verbal progress reports to the client at the end of each period on site. 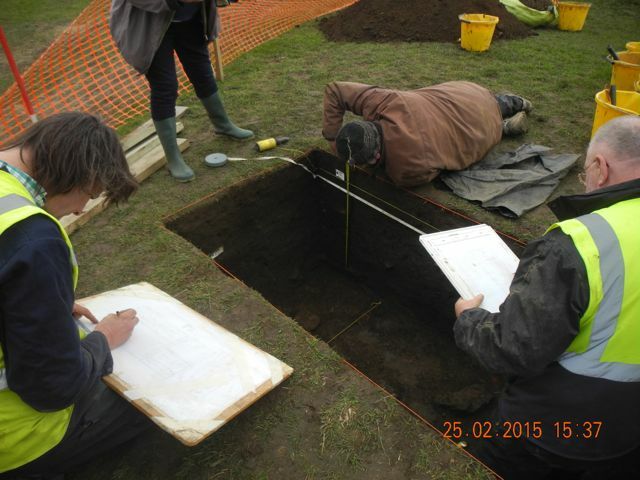 Additional written reports may be provided should unexpectedly significant archaeological remains be recorded. 8.2 A preliminary written report will be supplied to the client within one month of the completion of the fieldwork. 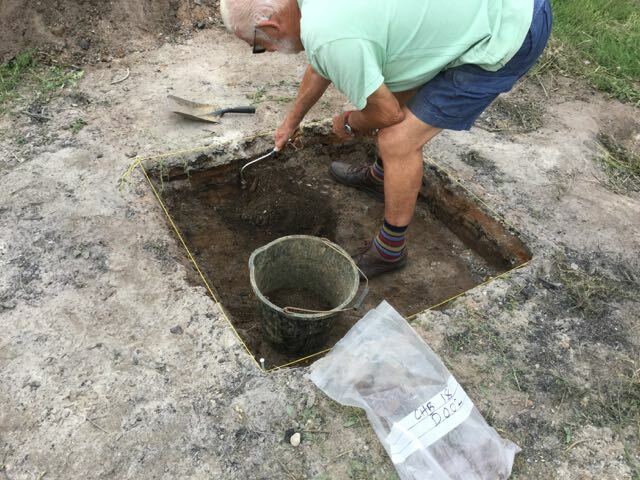 This will comprise a written summary of the key findings of the evaluation excavations and initial interpretation of the remains and their potential significance. This report will be supported by drawings and photographs as necessary. • an appendix containing a list and summary descriptions of all contexts recorded. • and Archaeological Data Service, OASIS (pdf). 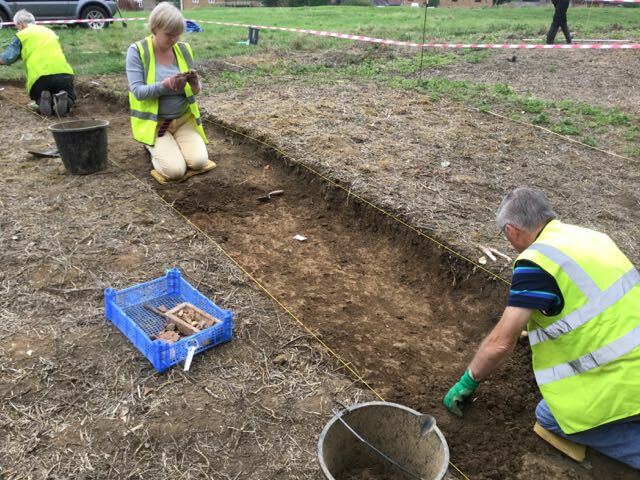 The results of the excavation will be supplied in a form appropriate for the Northamptonshire HER and made available in summary to appropriate regional and national publications. 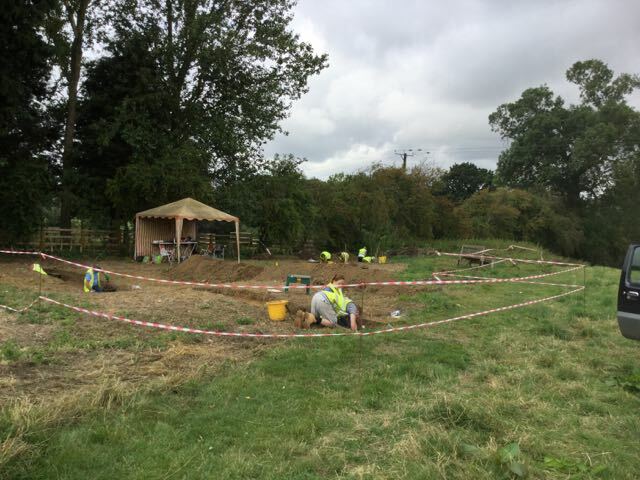 9.1 Provision will be made for the deposition of the physical archive with the contractor pending its ultimate transfer to the Northamptonshire Archaeological Resource Centre. The site archive will contain all the data collected during the project and will be quantified, ordered, indexed and internally consistent. 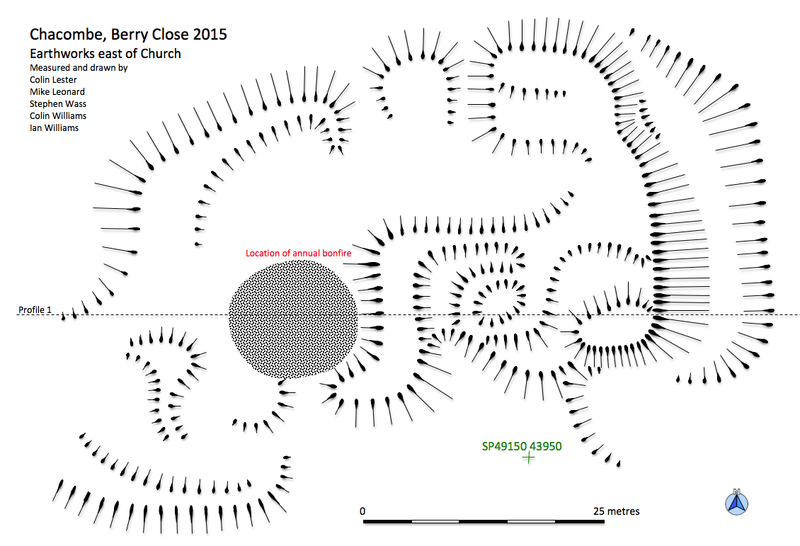 Back in 2014 I was approached by Ian Williams and Geoff Jones, two individuals with a strong interest in the field known as Berry Close which lies next to the church in Chacombe. All empty fields next to churches are interesting and it was clear from the earthworks in the field that something special was happening here. An entry into the archaeology of the site was offered when it was decided to erect a large stone monument to the donor who gave the field to the people of Chacombe. 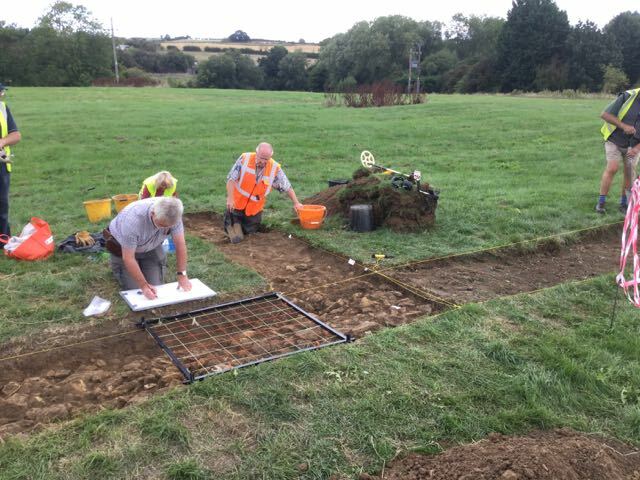 A condition of the planning was that the seating for the stone should be investigated archaeologically which lead us to stage the first Chacombe Archaeology Weekend. 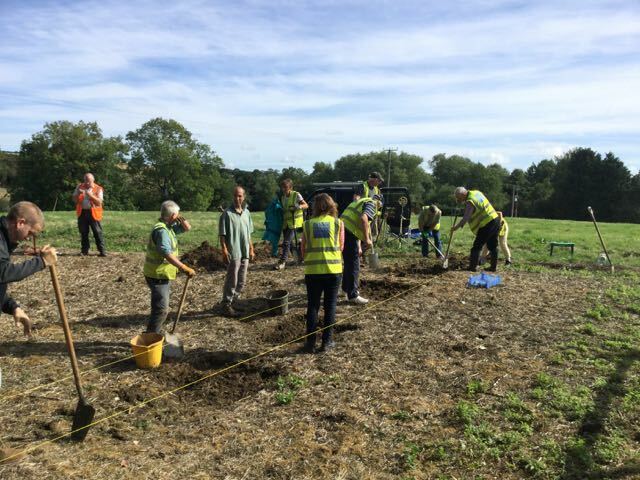 of course any programme of archaeological work associated with planning begins with a detailed plan known as a Written Scheme of Investigation (WSI). It's a fairly dull document but if interested you can read ours HERE. The weekend of the 21st. / 22nd. 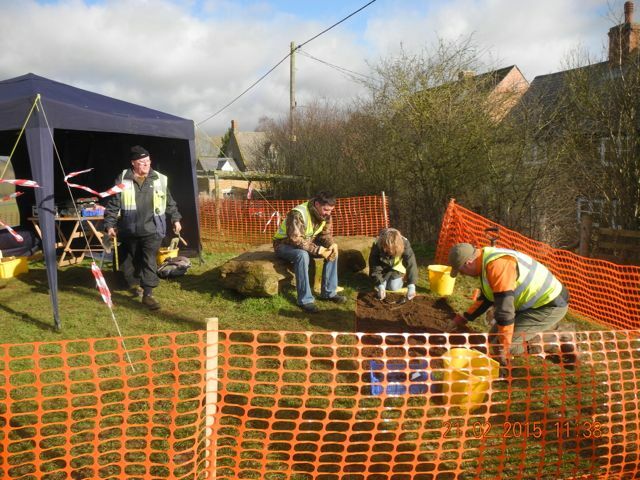 saw us supporting the Chacombe Archaeology Weekend. A small group of local enthusiasts have been encouraging their community to take a more informed interest in Berry Close, this suggestively named field next to the church. The field is packed with earthworks which to my eye had the look of a small medieval ringwork with attached settlement remains. 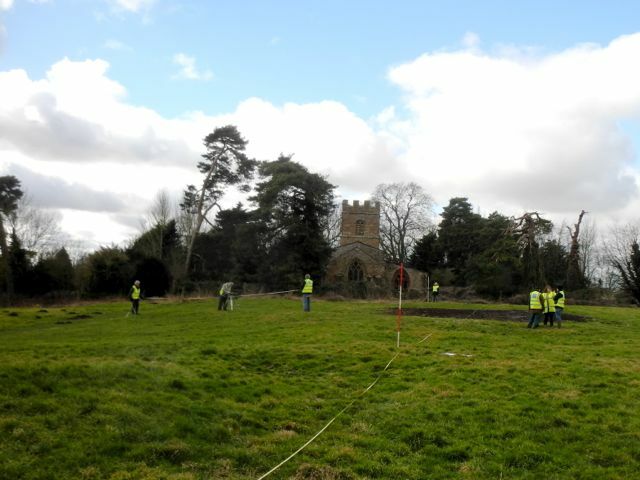 There was a portion of a large rampart and ditch which looked defensive and behind the rampart were clearly visible the grass covered foundations of some major stone buildings so during the event we had teams of volunteers working on surveying in detail for the first time these remains. 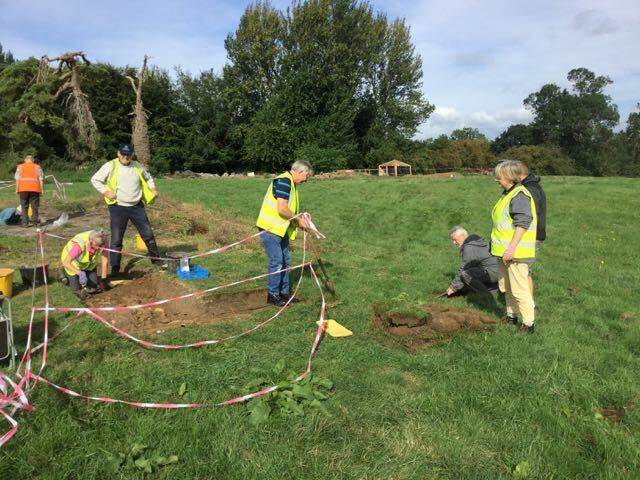 The monument was to be set on a low bank and we were charged with digging out a trench 2 metres long by 1 metre wide and 1 metre deep. We had a number of willing and able volunteers to assist with this and would have finished by the end of Sunday if it hadn't been for the arrival of a vicious winter storm around 1.00 p.m. The results needed some thinking about, most of the bank seems to have been composed of loam of varying quality but the good news was that within this were certain horizons where we found a very extensive assemblage of medieval pottery. The day before preparations are nearly complete then Saturday morning dawns clear and bright and Pater puts his team through their paces. Out in the field Mike leads his team of surveyors. Verna and Hazel had not sloped off to the pub but were getting acquainted with the level of the 110m contour. Back on the field large scale surveying and heavy duty conversation. Fitting four diggers round one trench... easy, until it starts to get deep. We were delighted to welcome local planning archaeologist Liz Mordue on a site visit. 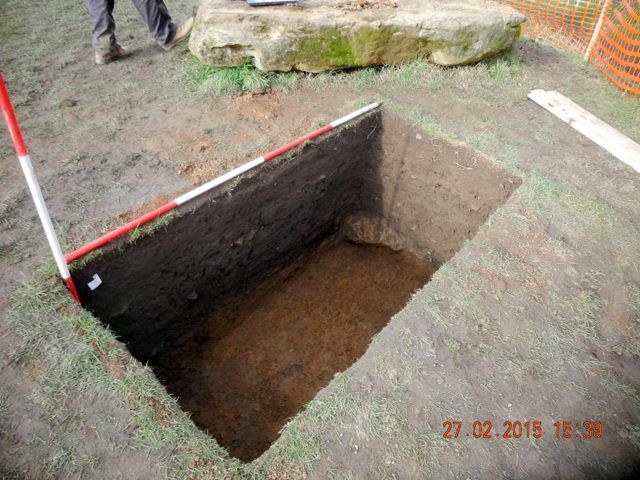 On the weekend of the 21st of February 2015 I went to the archaeological dig in Berry Close. The reason we were there was that there was a dig there because some people wanted to stand one of the big sand stones up as a tribute to Mrs Bennet who released the field to the public. 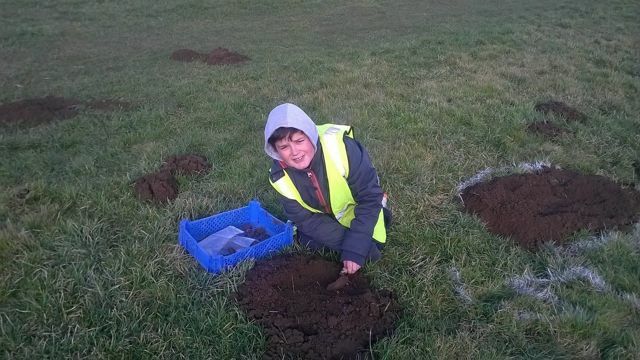 But when you are digging in a site like Berry Close (which is on the Jurassic Way) you have to excavate it properly. When I arrived I was asked to dig up some marked molehills. I had to dig up molehills because when moles come to the surface they pull up a lot of objects that have been previously buried, when I dug in the molehills I was asked to remove anything that was not dirt from the mound of earth. Whilst I was there we found numerous things including some animal bone, some possible pieces of pot and a piece of clay pipe. 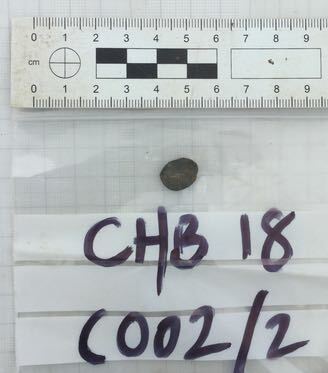 In the main dig, some practice musket balls were found. 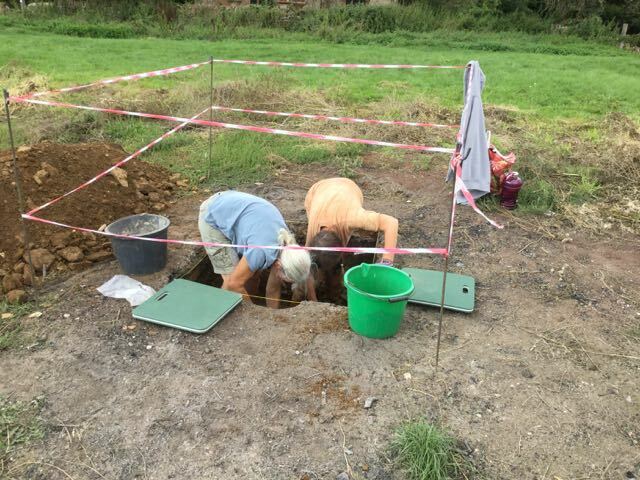 On Saturday afternoon we went to the field to see the archaeologist who was digging a pit in the filed next to the pub, we were asked if we wanted to do some digging. After the safety brief we had to put on gloves and a high viz vest. 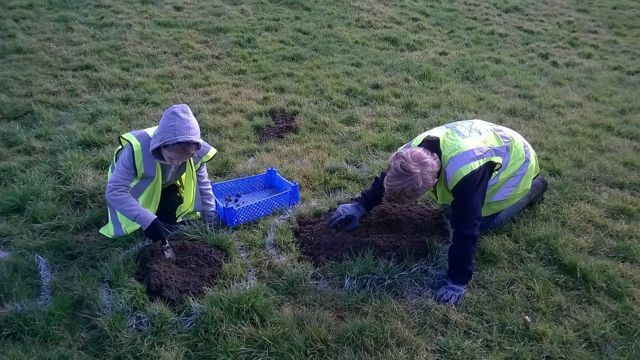 Our job was to scrape mole hills in different places in the field to see if the mole hills had finds and find out the differences that happened in different places. Kneeling down next to thew molehill i used the trowel to scrape the dirt towards me a few centimetres at a time looking closely for bits of pottery, glass, metal or stones, until we had scraped the mole hills to ground level. We then washed the finds in very cold water for Stephen the archaeologist to look at for us. In the mole hills nearest the mound we found bits of flint, pottery, stones, plaster and burnt bits of wood and a nail. At the bottom of the field we found nothing in the mole hills which means that at the top of the field there could be a building under the grass and not at the bottom of the field. Our human moles (Photos by GJ). Sunday just before the storm hit, a new level (A004) has just been defined. And here we are rapidly clearing up loose soil as the rain begins (Photo by GJ). 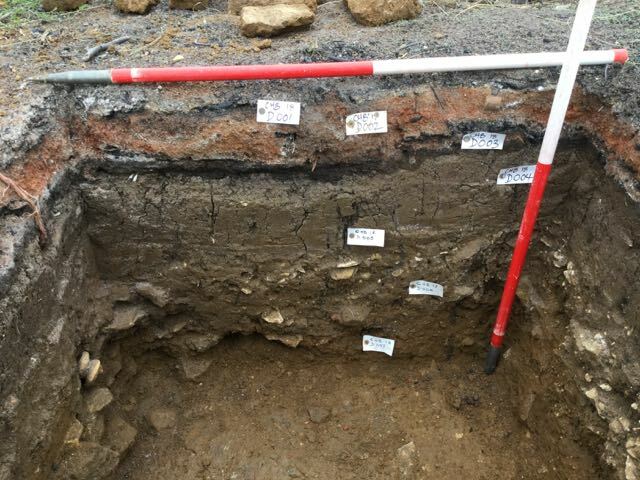 Because of the bad weather on Sunday we returned to the site the following Wednesday and the material we had started to see appearing turned out to be primarily burnt daub as in wattle and daub. This is a common phenomenon on many sites where a building has burnt down the daub - which is mainly clay - gets fired. 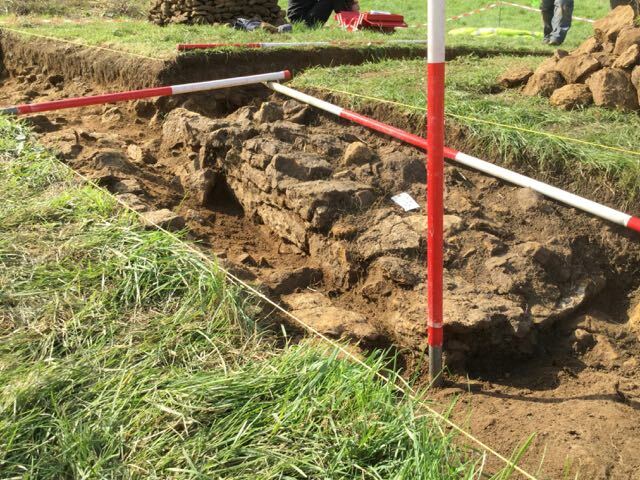 In our case we had elements of the finished facing of the wall and pieces which preserved the placing of the stakes that would have supported the wall. Mixed in with this destruction layer were further fragments of early medieval pottery. Things became really exciting as we cleared this deposit to uncover a small arrangement of flat stones which was almost certainly a post pad or a base for a vertical timber post supporting some structure and underneath that a further post hole and possible slot for a horizontal beam, probably belonging to an earlier building. An amazing amount of evidence to recover from such a small 'random' area. Once the pottery is washed and examined we'll have a much better idea of the dating of all this. Unfortunately working in such a confined area it's quite difficult to make sense of the structural elements but we can be sure there was plenty going on here in the middle ages. Post pad to the right, charcoal spread to the left. Some of the fired daub and samples of the pottery that was coming up. Underneath the post pad a complicated arrangement of hollows and burnt clay and underneath that slot and post hole. And then it was all over except for the pot washing and office work. People often have to be reminded that in general terms one day's digging generates two days back in the office following it all up, sorting out the drawings, checking the records and then writing up the report. An early step was to take the rough pencil plan from the survey of the manor mound and draw it out as 'best' for publication. Here it is and it shows just how much detail can be recorded by careful observation of the 'humps and bumps' on the ground. One can clearly begin to see the potential outlines of buildings amongst what initially seems a confusing pattern of earthworks. 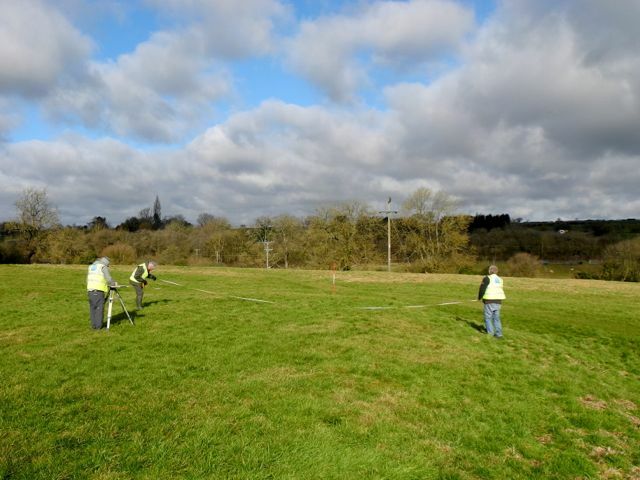 Another task was to join up the dots on the earthwork profile drawn through the main earthworks on the 'manor' site. The following weekend we gathered at Geoff's place where he had helpfully set up doors on dustbins to give us a working surface. Then after the appropriate briefing the group set to work. 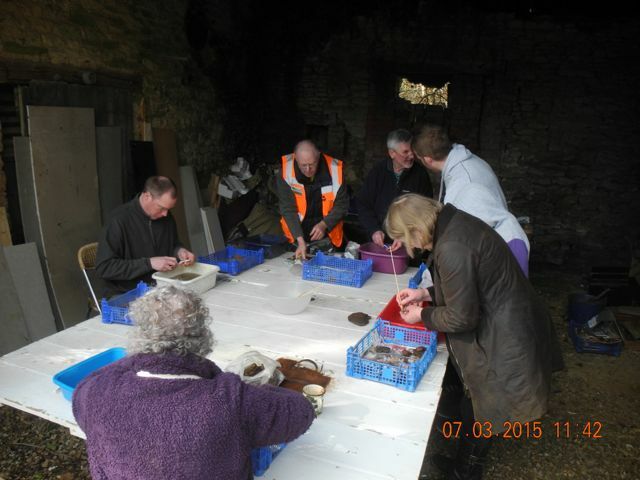 By the end of it we had identified 76 medieval pot sherds weighing in at 0.8 kg. that seems quite a lot for a small trench in a corner of a field. Still it will give us plenty of material to analyse once we have made a pilgrimage to look at whatever exists in Northamptonshire by way of a type series. The occasion, as well as being one for good coffee, also gave everyone lots of chances to talk over some of the issues raised by the dig. 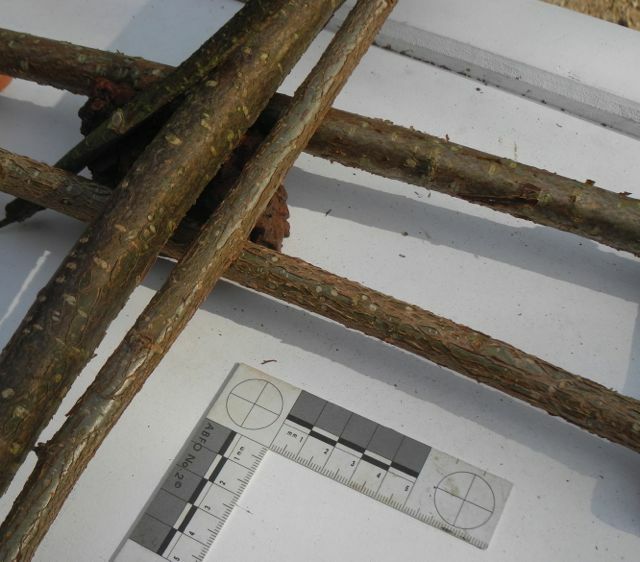 Geoff made some interesting suggestions about the firing temperatures and colours of the local clay as well as ingeniously cutting hazel wands of suitable dimensions to recreate the arrangement preserved in one of our lumps of preserved daub. A happy band of washers and Geoff's hazel wand confection.